So you want to grow. Well, the formula is simple: X number of leads turns into X dollars in sales. Seems easy, right? All you need is leads. Leads are not all created equal. The leads that turn into real sales come in two types: Marketing Qualified and Sales Qualified leads. Getting more of either type requires strategic marketing campaigns that target specific buyer personas. Using the inbound marketing methodology, the lead generation portion of a campaign happens by driving online traffic to landing pages. These landing pages usually include a form and trade some type of offer or exclusive content for your contact information. As soon as this first form is filled out, you’ve got a Marketing Qualified lead (MQL). Essentially, it’s a green light to start personally nurturing that contact towards another offer with automated email drips. Unlike the first introductory content offer, this one should be a little closer towards a purchase, like a case study, discount or free demo. Once your lead downloads this second offer, they’re considered a Sales Qualified Lead (SQL) and are ready for a deeper nurturing email automation drip that moves them toward a purchase. This process of identifying ideal leads, then creating and deploying strategies to reach them, is called Lead Generation and it’s the fastest way to drive new customers and grow your business. The Impulse Creative inbound marketing team handles the entire lead generation process from top to bottom. We focus on strategy, by using real data and industry information defining who you’re trying to reach, as well as the best tactics and services to reach them. We’ll begin by using questions, tools and expertise to discover your ideal client and define their buyer persona. Then, we’ll develop a strategy to address the reason each persona needs your products or services (pain point), with the right content. 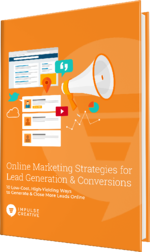 The next piece of your lead generation campaign is traffic-driving tools like blogs or paid ads, that drive visitors to your campaign landing pages, where the content offers we’ve created are waiting to convert new leads. Finally, we’ll create the automated email drip campaigns that turn marketing qualified leads into sales qualified leads, and sales qualified leads into customers. Tracking is the very last piece of your campaign. By connecting all the campaign pieces with links, we can track your campaign’s progress, ROI and cost per acquisition. It’s tempting for a lot of businesses to head right to a lead generation agency and pay a high cost per lead to boost their sales. Unlike those guys, we charge for our services, not your success. And our method keeps working long after you need us, steadily bringing your cost per aquisition down over time. Harness the power of HubSpot by defining your plan, creating buyer journeys, setting your tools up for success and learning automation and reports.